under the 'Path of the Skinwalker' part 2 heading. 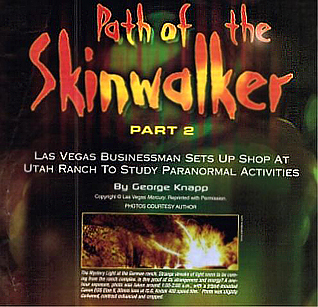 George Knapp took this photo, expecially due to its placement under the words "PHOTOS COURTESY AUTHOR"
Path of the Skinwalker part 2 article in the June/ July 2003 issue of UFO Magazine. 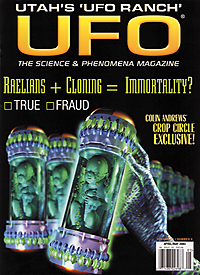 UUFOH (via Dave Rosenfeld) offer exclusive photos of the Ranch to UFO Magazine in April after finding out they are featuring the Path of the Skinwalker articles by George Knapp. We thought the photos offered would be a great addition to the article and since they are from a local investigative source, they are new, unedited, uncensored, detailed and even beautiful. 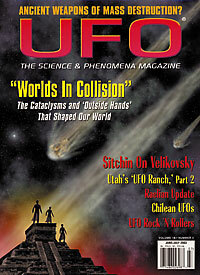 Vicki Ecker (UFO Magazine) wrote: "Thanks for the opportunity to run new, great shots!" " I heard from Bix and he said your photos were not resolution we can use. George had some other pix that we used and the story has already been laid out. If you're interested in contributing in the future, though, please let us know!" I wrote back saying "I have Video quality resolution,".. etc. etc. and never heard back from them. so.... I figured something pushed them away from the photos, (think !) and thought oh well, their loss....... its a shame the public audience reading this interesting set of articles won't see interesting photos to go with it. I then informed the rest of the team that the photos were turned down by the editor because of....... resolution? Even though high resolution versions were offered. was listed as the second place winner in Webwatch. I thought cool, but hmmmm. Why the turn around? and why didn't they inform us that they were going to use / publish one of our photos after all? Note: UFO Magazine posts "PHOTOS COURTESY AUTHOR"
So they published the UUFOH photo of the Mystery Light at the Ranch without proper credit. "NIDS is a black hole. Information goes in, nothing comes out"